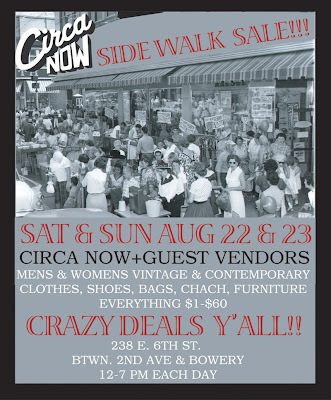 go spend your summertime dollars at the CIRCA NOW sidewalk sale this weekend!!! i am sad not be there to sell my wares amongst some of the best gals in new york, but my platforms and polyester will be there in spirit. GO FORTH and buy something UNREAL for me, k? We may have to move this wonderment inside tomorrow thanks to a tornado on the way from Toronoto (thanks Lisa! ), but it is definitely goin' down RAIN or SHINE!